In the process of building the next batch of Ad-Mech, and in between gluing my fingers together and trying not to cut off any fingers with the ol' exacto blade I finished painting up the first of the as-yet-unnamed Inquisitor's warband - Tranquilla Morte, Death Cultist of the Imperator Ex Sanctus Sanguine sect. She was already half painted when I pulled her off the shelf, so mostly it was just a matter of finishing up some detailing. Bit of gold, bit of parchment, some hazard stripes and she's ready to cut the enemies of the Imperium into little quivering chunks! The model is a little cheesecake-y, but also has a sense of menace to it. I'd considered adding some blood spatter to the weapons, but found that my bottle of Blood for the Blood God wasn't sealed properly and had dried into a solid mass. Gotta find some time to get to the hobby shop to pick up a new one, I suppose! Was quite fun to just paint a single model for a change! tee hee hee. Quivering mass. soooo many dirty jokes come to mind. Great painting, nice mini. Where is she from? Check out Tamiya Color's Clear Red X-27. I think that's what GW tried to emulate with their Blood. Cheaper for more, and a tough glass pot that keeps forever. I like cheesecake and with deathcult, it seems its this or skin-tight bodysuits, so the whole image is cheese one way or another. 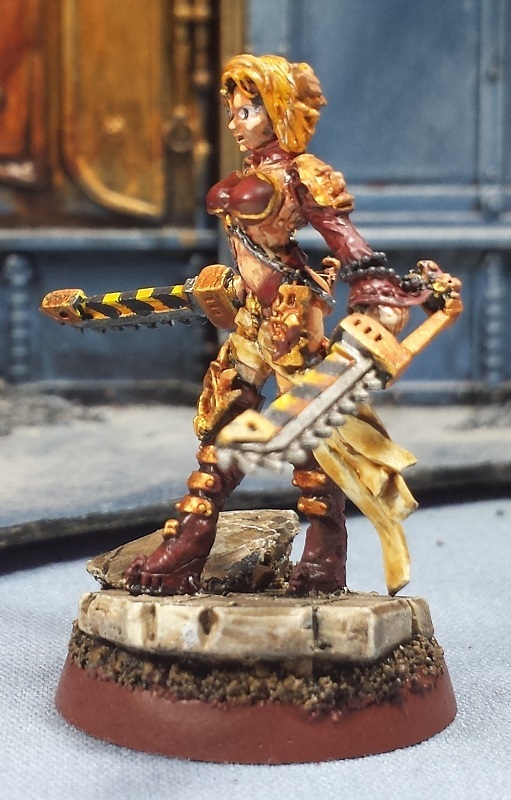 I would also like to know where the sculpt is from? Nice model! Those dual chainswords would be a wicked combination in a Dark Heresy game. If only my old group still got together, alas. I join my fellow commenters in wanting to know what range she's from. i have some arcane sword bits that would be perfect for her! I like her outfit. I'd think twice about making a pass, depending on how personable she was. Uh, I suppose she'd not be that chatty. Oh well. @Zab: Haha! I got her (and a few others) from a seller on eBay, called montastore. @RabidChild: Nice - I'll give that a try! @Dai: Aye, I generally steer clear of the over-sexualized female models, but it's actually hard to find non-pinup poses. 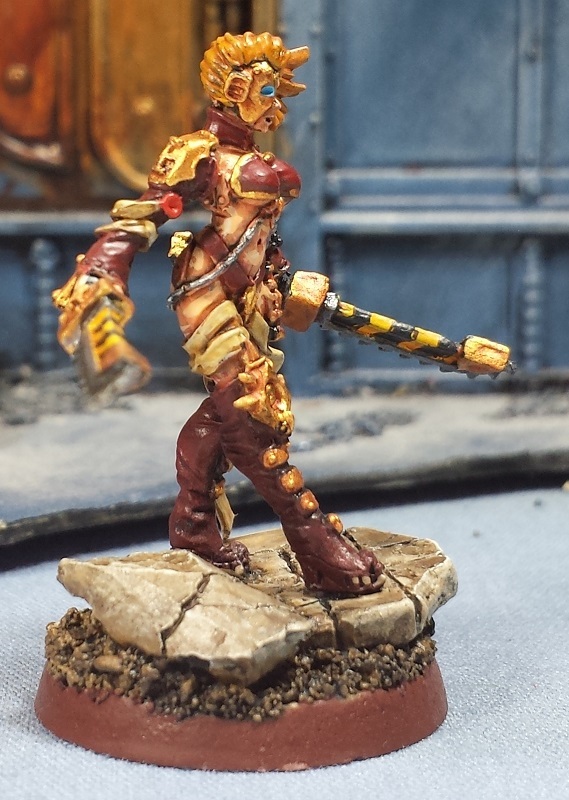 Victoria Lamb's female Arcadian sculpts are far cooler and realistic, exactly because they're dressed sensibly for the battlefield! @Phil Morris: Totally! It was the half mask that caught my attention in the first place, a very cool stylistic touch! @Rory Priest: Aye - There's a couple more cheesecake models in the wings that I'm planning on going bodysuit with instead of skin. Broke down & ordered. That mini is too cool not to have! Hi there, quick comment/question off-topic! I saw the scratchbuilt Leviathan you built back in 2012, which I think looks great. Would you have any objections if I built myself a similar model based on yours? Mine would be to go with my Squat army, for which I already have two Overlord airships built, and a Land Train in construction. 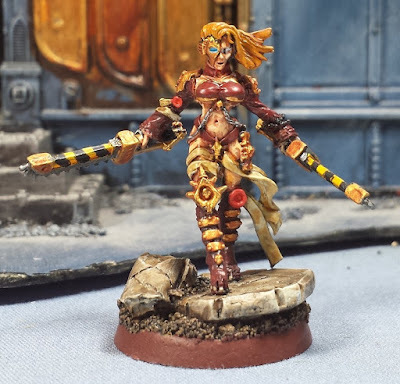 Excellent conversion, Love that mask! 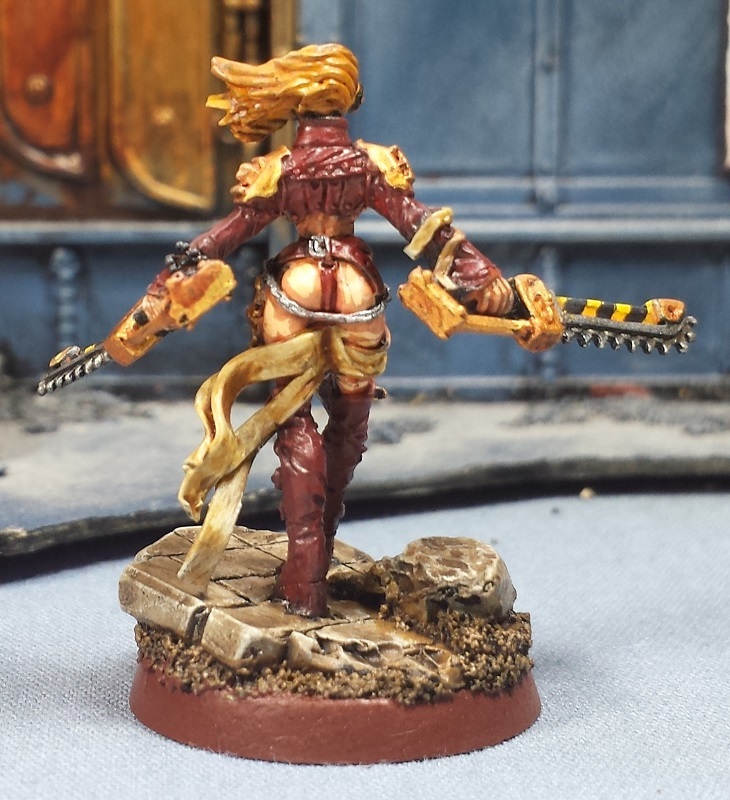 @#2501: Indeed, they do some really interesting models - some of their Sisters of Battle are very Blanche-ish! @Graze: Absolutely man - Would love to see what you come up with! I'll admit I stalled on the project, it still lurks in the Closet of Doom for some rainy day. Looking forward to seeing what you come up with! @Vent: Cheers man - it's definitely what drew me to the model initially, too!